The DHE AU instant water heaters deliver hot water with precision. Comfort is the number one priority as the DHE AU 18 and DHE 27 AU deliver hot water exactly to the degree. 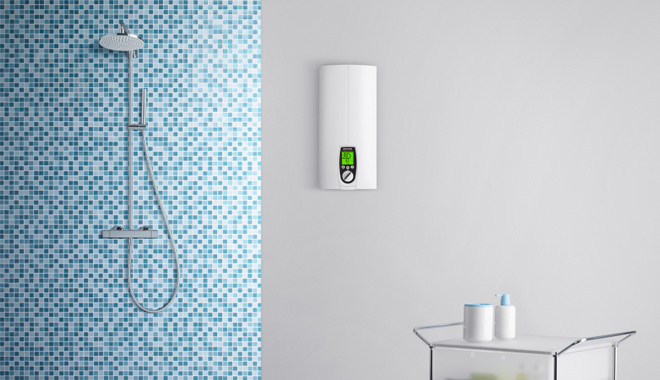 Utilising 4i Technology, the intelligent fully-electronic water heater compensates for fluctuations in pressure and temperature and using its series of sensors it precisely regulates the hot water output. This ensures that you get your requested hot water temperature to the degree. Made in Germany, high quality design from STIEBEL ELTRON. *Conditions apply - refer to warranty policy for full details. Contact your local energy provider and inform them of your address. They will be able to let you know if you have 3 phase power available at your address. 2. I have 3 phase power at my property, can I install a DHE instant hot water system? You will need to check with your electrician to find out how much 3 phase power is available in "Amps per phase". The DHE 18 AU water heater requires 27 Amps per phase, whereas the DHE 27 AU requires 40 Amps per phase. 5. How can I tell if I have a DHE 18 AU or a DHE 27 AU? Underneath the dial that adjusts the temperature there is a flap that pulls forward and then drops down. A rating label is located up under the flap showing the model and size - DHE 18 AU or DHE 27 AU. 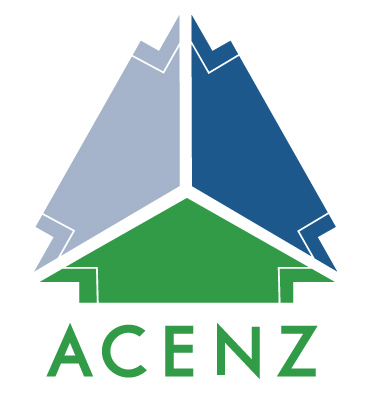 Within the downloads section of the DHE you can download a pdf showing you exactly where and how to locate this sticker. 6. 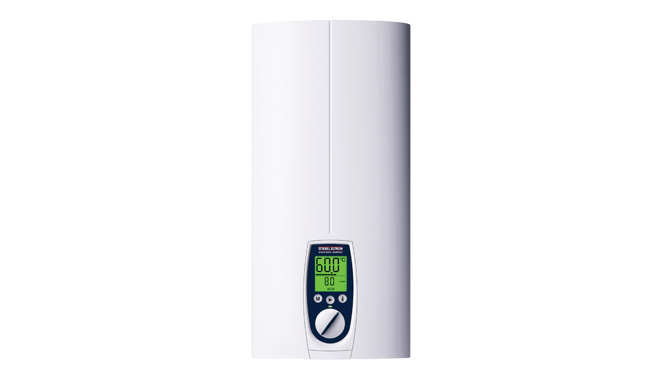 What hot water temperature can the DHE AU water heaters deliver? The DHE 18 AU and DHE 27 AU can deliver hot water at 60°C. 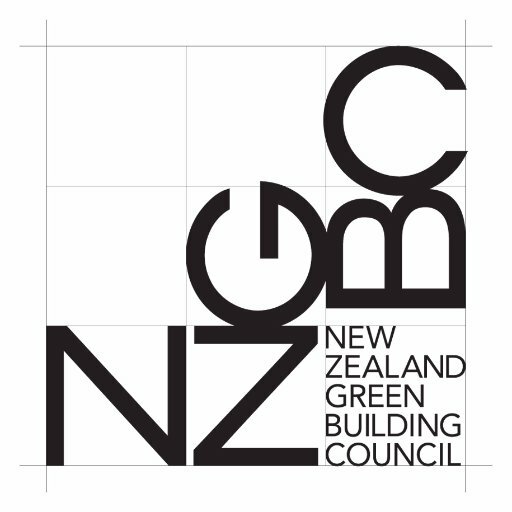 If supplying hot water for a domestic bathroom, the plumbing regulations require the installation of a temperature control device to supply water not exceeding 50°C. 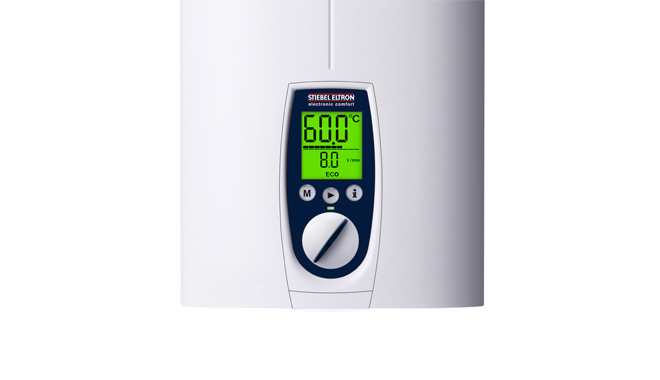 Alternatively, the STIEBEL ELTRON DEL AU instantaneous electric water heater may be a suitable choice which delivers hot water not exceeding 50°C in accordance with AS3498. Click on the DEL AU product to find out more. 7. Where can the DHE AU instant hot water system be installed? The water heater can be installed almost anywhere due to its compact size. The water heater does not require ventilation, relief drain or safe trays so it can be installed in a cupboard, in the roof space, below the sink, in a service cavity, in a Euro laundry just to name a few options. If installing outdoors, the hot water system must be protected from the elements by a protective covering such as a meter box. 8. I have an old DHE 21 electric instantaneous water heater but cannot see this model on this website anymore. Can I replace this model? This DHE 21 is no longer available and has been replaced by the DHE 18 AU three phase electric instantaneous water heater. The DHE AU water heaters are designed to be installed as close as practical to the most used hot water outlet. Installing closer to the point of use can help to save water and energy by delivering hot water quickly to the outlet. The STIEBEL ELTRON 3 phase electric instantaneous water heaters are designed to service multiple outlets located several metres away from the system. Compared to a storage hot water unit an electric instantaneous water heater can be up to 30% more efficient. This is due to the water heater not storing any hot water and not incurring heat losses from storing a body of hot water. 11. Where can I purchase a DHE AU water heater? The DHE AU water heater range is available from all leading plumbing stores.